We are a brazilian-belgian travel agency, already active since 15 years with tourism in Brazil.. Based in Natal and Rio de Janeiro, we operate as a national touroperator. We mainly book individual round trip packages – custom made. These packages are best booked in advance through the internet, in combination with the Brazil Airpass,always the cheapest way to fly through Brazil. 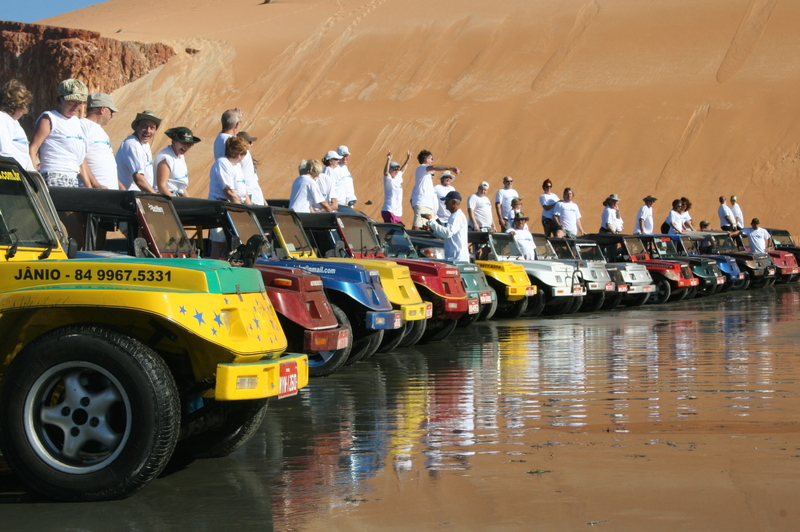 A Fortaleza – Natal beach buggy package is quickly booked !! This trip will lead you along beautiful beaches, untouched sanddunes and a fabulous inland. An experienced driver will take you along the shores, accompanied by specialised guides! The trip takes you for more than 500 km of beaches in 4 days time.. you can’t miss this adventure!! The nights are spent in fine hotels and so called pousada’s (full pension) and every day and night there are activities and beachparties – where teamspirit is the keyword. We also show you a lot of culture and “local colour”, which the native brazilian will appreciate. The groups are accompanied by a team of professionals, who all speak English. – As soon as you exit from the Customs hall at the airport you will be greeted by our local representative, who will assist you in all possible ways during your transfer to the hotel. -Transfer to the hotel with bus with airco. “a volonté” especially the meats are delicous !!!! Transfer from the hotel 15 min. What to wear: Shorts, t-shirt, long sleeves shirt, sandals, swimming trunk/suit, cap, sunglasses, towel ,sun block and lugage. 09.30 H Departure with the buggy’s to Canoa Quebrada. 08.00 H Brazilian breakfast at Long Beach. 08.00 H Breakfast at the pousada. 08.30 H Check out and trip to Galinos. Galinhos is a combination of sea, river and green. Besides enjoying the beach, tourists can get on a boat and take an ecological tour down the river appreciating the manguezal, a natural environment of the region. Also with the boat, visitors can visit some salines (farms where sea salt is produced). The beach in Galinhos has a much wider sand strip; in several points, there are trees and natural grass. The village is still very small, most people still live of capturing shrimps and crabs. 14.00 H Lunch at hotel-condominium do Siri and check-in. 20.00 H Apero and dinner in the pousada with night theme ??? Natal, Capital of state of Rio Grande do Norte, is developed at to speed into the beach capital of the Northeast. The main attractions are the beaches, the buggy rides and the nightlife. Free day on the beach of Ponta Negra. Lunch and Dinner in the Hotel. The village of Ponta Negra is a few square kilometers large. It used to be home for fishers and other working people; around early 1990’s, the tourism businesses began to take over the area; a few years ago, foreigner investors (notably Italians, Portuguese and other Europeans) started to pour money into the area, and tourism oriented businesses flourished. Today, there are men at work all around the village. Medium and small hotels and flats are being built everywhere. Houses are being refurbished and adapted to become restaurants, shops, etc. Ponta Negra beach is about 4 km long. In the south end is Morro do Careca, the most famous landmark of Natal. Walking northwards, one first sees about 2km of av. Erivan Franca, crowded with bars, restaurants, hotels, party houses, small shopping galleries, etc; then, the avenue ends, and the next 2km have just a walk way, lined with small hotels and some small snack barrows.